Yesterday we posted about Pat Smear’s pedalboard. You might have heard of Pat. He was in bands such as the Germs, Nirvana and most recently Foo Fighters. In FF, Pat is primarily a rhythm work horse, dishing out the riffs and drive that make their music popular with all the kids these days. In order to get that job done Mr. Smear has a pretty tight pedal board, with only a handful of boxes to help him out. 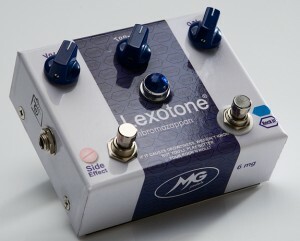 Among those you’ll find Boss TU-3 Tuner, Boss TR-2 Tremolo, an Electro-Harmonix Neo Clone and a pedal that we didn’t have in our database — the MG Music Lexotone. It’s in the database now! In case you don’t know, MG Music is a Brazilian builder founded by Marcelo Giangrande (that’s where the MG comes from). Marcelo’s love of effects pedals stemmed from a business he had in the 80’s and 90’s collecting and selling vintage gear. From there he started to fall in love with effects and decided to start dabbling with his own tones. Now, MG Music has a respectable line of amps and pedals that have garnered a lot of attention from fans all over the world. The Lexotone has a silicon fuzz tone on the left side and an octave effect on the right side. Packed into one reasonably sized enclosure this pedal has the ability to pull off some sweet 70’s sounds. Controls allow you to bleed and blend a bit of each to really dial in the tone you want. Right now we just have the Lexotone in our database, but we’re working on getting all of this new-to-us builder’s pedals online and ready for you to review. So let us know if you have any experience with MG music. We want to know more! Does the PATHETIC Video Demo imply that the pedal “MUST sound Better” in Real Life? you should try it before making Pathetic comments!